The Morgan Lee Band is a six piece Glasgow-based group. 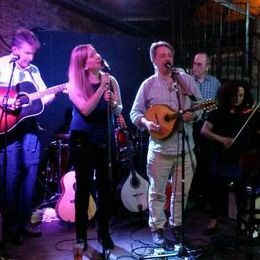 The line-up is Anne Morgan (fiddle, viola, backing vocals); Hugh Lee (lead vocals, mandolin, bouzouki, fiddle, harmonica & whistles); Emma Joyce (lead vocals, accoustic guitar); Tony Llewelyn (accoustic & resonator guitars, backing vocals) and Ian Cleland (bass). We are particularly interested in the alternative edge of the folk music scene although we do play some 'oldies'. Our set list ranges from traditional material through to more contemporary and self-penned numbers . Hence we term our music ’Celtic Eclectica’.